Correspondence represents an important source in genealogy and history. I'm always amazed at how important family letters are. Ephemeral in nature, correspondence is often seen as not important and thus thrown away. I use correspondence a lot in my research. A family letter penned by a 5th great-grandfather provided the names and birth dates of all his children. Saved for generations, this letter owned by a distant cousin was an important piece in a genealogical puzzle. 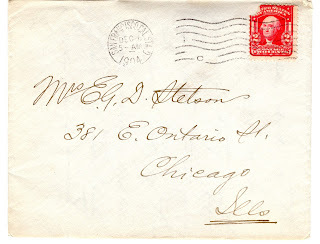 A letter I found a few years ago addressed to my maternal grandmother from a genealogist in the UK helped me better understand the family history research she had conducted. Surprisingly, she didn't give me the letter because she thought it had genealogical value. She gave it to me when I was a child, for my stamp collection. A Civil War era letter written by a distant relation, found in a microfilmed collection, tells of his experience weeks before his death. A heartbreaking read that provides us insight into his experience and the pain his family endured. Letters are private in nature and in some cases reveal family secrets. A set of letters I was given by a cousin, details the private thoughts of her parents as they found they were facing an unplanned pregnancy in the 1940s. Another set of letters that are part of a research project I've been working on for a few years are the early 20th century love letters between a married man and his mistress who later became his 2nd wife. No doubt these letters were meant to be private. But letters provide us with history and help us understand previous generations, the struggles and decisions they faced. Similar to journals, letters provide us with the original sources we need to "do" history. A recent AARP article suggesting the destruction of family letters as a means to declutter your home brought about some justified outrage in the genealogical community. Amy Johnson Crow and Denise Levenick both wrote great posts about the topic. I too worry about how the obsessive emphasis on decluttering ultimately impacts what history and family history the future will inherit. I think what's important to remember is that letters, not matter who the author is, are history. If it isn't acceptable to destroy letters from historical or famous people like George Washington and others, why is is ok to destroy the letters of our family that can one day be used to study their place in history? So, hopefully, I've convinced you that letters are important but I know you're asking "where do I find them?" Well, to start with they could be at your home or a yet unknown cousin's home. But they could also be in a manuscript collection. Start by searching on ArchiveGrid for the place your ancestor was from. You can learn more about family letters including those that were published in the newspaper in my GenealogyBank blog posts, Dear Mother: Family Letters and Your Genealogy and Genealogy Tips for Researching Letters in Newspapers. Letters are an important historical source. Afterall, if we didn't respect the power of letters to tell history, we wouldn't know that Abigail Adams admonished her husband to "remember the ladies." An admonishment that is important today as we research our female ancestors.